Indian Prime Minister Narendra Modi participates in a mass yoga session along with other practitioners to mark International Yoga Day at the Forest Research Institute (FRI) in Dehradun on June 21, 2018. 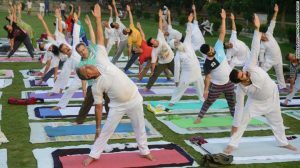 NEW DELHI, INDIA – Indian Prime Minister and longtime yoga practitioner Narendra Modi led an estimated 50,000 volunteers through a series of yoga asanas Thursday to celebrate the fourth anniversary of International Yoga Day. The 67-year-old leader, who lobbied for international recognition of Yoga Day in 2014, landed in Dehradun, Uttarakhand late Wednesday, but was up early to take his position on a bright orange yoga mat. Uttarakhand, home to the city of Rishikesh and a self-professed “abode of the Gods” has long been a center for yoga tourism. 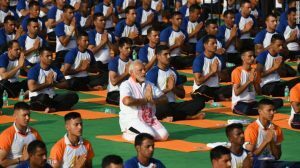 The Prime Minister’s decision to celebrate International Yoga Day in Dehradun was warmly welcomed by the Chief Minister Trivendra Rawat, who said he hoped it would cement the state’s status as a premier destination for yogis worldwide. Members of the Modi administration followed the Prime Minister’s lead and either attended or hosted yoga events around the country. In Mumbai, Vice President M Venkiah Naidu and Maharashtra Chief Minister Devendra Fadnavais attended a yoga event hosted by the BJP Mumbai chief Ashish Shelar, and Minister of Railways and Coal Piyush Goyal also tweeted pictures from a yoga session he attended in Noida, Uttar Pradesh. 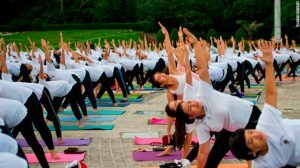 Several ministries, like the Ministry of AYUSH, launched mobile app “Yoga Locator” giving details of yoga activities in a particular surrounding area, while the Ministry of Women and Child Development launched “#YogaFor9to5”, a contest to generate awareness on the benefits of yoga at workplace for women. Indian visually impaired and partially visually impaired girls participate in a yoga class at Andh Kanya Prakash Gruh in Ahmedabad on June 20, 2018, on the eve of International Yoga Day. People of all ages can be found practicing yoga in parks all over the country. Indian yoga practitioners take part in a yoga session ahead of International Yoga Day at a park in Amritsar on June 20, 2018. And they can also be found stretching on their yoga mats all over the world. People participate in an outdoor yoga session at a park in Yangon, Myanmar to celebrate the International Yoga Day.